Another new set, more new cards, and more chances for hope to spring eternal. As always, players are wildly speculating on their playability and trying to fit new cards into everything. I’m not immune, and especially now that the full spoiler is out I have been looking for and testing Modern playable cards. Two in particular have stood out, and today I will be sharing my results with Militia Bugler and Supreme Phantom. The first card that I saw spoiled and got me testing new cards is Milita Bugler. I’m a Death & Taxes player at heart, and I’ve longed for Recruiter of the Guard or even Enlistment Officer in Modern. Recruiter was a sea change for Legacy Death & Taxes, becoming the card advantage engine the deck needed in addition to finding lockout creatures; Officer is the lynchpin of Soldier Stompy. So far, it appears that Bugler is as good as it will get for Modern. I still have hope, considering Sylvan Messenger is legal, but given Bugler I won’t hold my breath. Not that this is a dig at Bugler. It’s a perfectly playable card, if far more narrow than its forbearers. Most of the maindeck and sideboard are findable creatures with Bugler. Humans’s greatest weakness is running out of cards, and Bugler digs for more creatures. Furthermore, Bugler requires a deck with a very high creature count, and no deck plays more than Humans. On paper it appears like the perfect fit, and according to a certain segment of the playerbase, a huge mistake on Wizards’ part. I’m not convinced that Humans actually wants Bugler. The maindeck is effectively set in stone, with only 1-2 flex slots depending on how many Thalia, Guardian of Thrabens are needed. Which cards fill those slots depends on the pilot. Martin has a Dark Confidant and Kessig Malcontents maindeck with another Confidant in his sideboard. I’ve seen anything from Restoration Angel and Shalai, Voice of Plenty to Whirler Rogue and Dire Fleet Daredevil in those slots. Bugler needs to distinguish itself above the other options. Bugler is a value creature, so it is most directly competing with Dark Confidant. Bob dies to a stiff breeze, but otherwise runs away with the game. Bugler is more durable but more costly, which is important in a land-light and mana-hungry deck like Humans. It also only “draws” once. Bugler also cannot find Mantis Rider, arguably the best topdeck in Humans. Considering that value creatures are most important in attrition matchups and Rider typically shines there, this weakness is a significant strike against Bugler. I’ve been very underwhelmed with the card in Humans. Worst-Case Scenario: Turn four on the draw, no mulligan. One land and one Aether Vial in play. Have drawn only 2 power creatures. 49 cards in library, 3 Vials, 18 lands, 4 Mantis Rider, and 24 hits remain for a simple hit probability of 49%. Odds are 24 : 25 to hit any legal creature. Realistic* Best-Case Scenario: Turn three on the play, no mulligan. Three lands and two Aether Vials in play. Have drawn Vial and fourth land, opening hand had two Riders. 50 cards in library, 2 Vials, 14 lands, 2 Riders, and 32 hits remain for a simple hit probability of 64%. Odds are 16 : 9 to hit any legal creature. *It’s not the ideal scenario, but actually keeping a starting hand of only Bugler non-hits in Humans is implausible. In this simplified scenario, Bugler is favored to hit in the best case and an even chance in the worst. The “real” probabilities will be different because this scenario is technically conditional probability, and more accurately a hypergeometric distribution, but I’m not Frank Karsten so I’m keeping it simple. The starting density of hits means that Humans is the “best-case scenario” for Bugler. Mono-white Death & Taxes runs 22-24 lands, 4 Aether Vial, and 4 Path to Exile as non-creature cards. My decks run 4 Flickerwisp and 3 Restoration Angel, and many decks are now adopting Shalai, too. That’s no less than half the starting deck not being eligible Bugler hits. Saheeli-Cord has 32-36 non-creature cards and some three-power creatures. The other toolbox decks have 28-30 non-creature cards and sometimes three-power creatures, but they also have Collected Company, which is just better than Bugler there. Because the deck that wants this kind of effect really can’t reliably hit with Bugler, and everything else doesn’t really need Bugler, I don’t think the card will become a Modern staple. It needs a different deck to really excel, and that deck doesn’t exist yet. I have a long history of working with Spirits, and I’ve been hoping for a CMC-2-or-less addition to smooth out the curve and plug a hole I’ve found in the deck. I didn’t expect to get almost everything I wanted from a Core Set. This deck was built to defeat Grixis Death’s Shadow, Jeskai Control, and Tron, all of which had become popular early in the season. Midway through, that is exactly what happened, but I never quite got there. The problem was that Spirits could not beat interactive creature decks that didn’t care about Chalice of the Void and creature swarms. Valakut decks were also problematic, because Spirits didn’t race well. The creatures are evasive and tricky, but they each beat for 2 at most and only had one lord. Trying to run Glorious Anthem effects never panned out in testing; they just made the deck threat light. Supreme Phantom closes that gap perfectly and synergizes with the rest of the deck as Metallic Mimic never could. The greatest weakness in most matchups was the low toughness of Innistrad’s spirits. Liliana, the Last Hope proved an absolute nightmare as a result, but Kozilek’s Return was brutal as well. Metallic Mimic wasn’t good enough because it wasn’t a Spirit until after it resolved ,and so didn’t work with Rattlechains or Cavern of Souls. Second, it didn’t help anything played beforehand, so Mimic was a terrible topdeck. It also died to anything. Phantom has three toughness, is always a Spirit, and buffs everything while in play. With Phantom in the picture, the only thing missing from my wishlist is Thalia, Guardian of Thraben‘s ability on a Spirit. Remorseful Cleric looks like a natural fit Spirits. Most of the time, it and Selfless Spirit will be identical; why not run the Cleric too? There are two problems with this, the first being space. Cutting Phantasmal Image is undesirable, since it synergizes so well with everything else, particularly Vial and Drogskol Captain. Cutting Path or Reflector Mage opens the door to being overrun by creature decks or synergies. The second problem feeds from the first: the ability is weak. There are times when removing the graveyard is devastating, notably in response to Past in Flames or multiple Prized Amalgam triggers. But most of the time, it’s marginal at best. Countering a Snapcaster trigger or Kolaghan’s Command returning something is fine, but not exciting. I certainly don’t think either effect is worth a card. Managing graveyards with one-shot effects is difficult, so even against delve, Cleric is underwhelming. There’s not place in my sideboard for Cleric either. Sideboard space is too precious to spend on marginal effects. It’s been a long time since Tormod’s Crypt was a good card, and giving it legs doesn’t change that. Nihil Spellbomb only sees play because it cantrips. Rest in Peace is devastating against the dedicated graveyard decks, and Relic of Progenitus suppresses delve and draws a card when necessary. The only reason I can see Cleric being a sideboard card is as a tutoring bullet. Perhaps the metagame will warp enough that maindeck graveyard hate is good, but for now I’m staying away. While I am talking exclusively about UW Spirits, there is an alternative. Bant Spirits put the tribe on the map, even though it never really caught on. It’s a fine strategy, but Devoted Company and GW Valuetown have proven to be better Company decks, the former because it assembles a broken combo and the later because its creatures are bigger. I’ve never outright dismissed Bant Spirits, but to me the real reason to run that deck was Gavony Township. Noble is good, but weaker than Vial against control, and Company is amazing, but requires a higher land count and can be clunky here. Size matters, and buffing Spirits is important, but now that Spirits has another lord, there’s less reason to run Township. 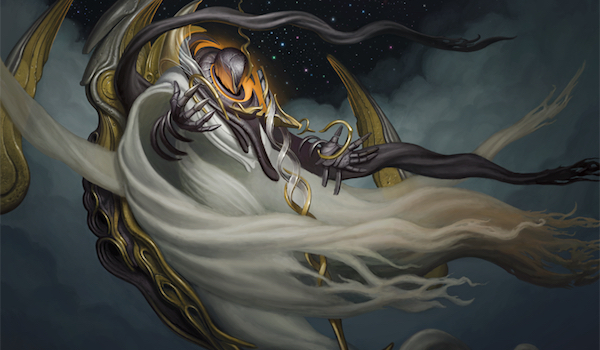 Does Phantom render Bant Spirits entirely passé? Maybe, but I wasn’t going to play that version anyway. Obviously, I can’t take upgraded Spirits to tournaments yet, but testing has been promising. Having not only another lord but a two-drop dramatically improves the curve, speeding up the clock while maintaining the disruption that attracted me to the deck in the first place. This has improved the big mana and creature matchups noticeably. The question is whether that’s good enough. As a disruptive tribal deck, it competes for space with Humans and Merfolk. Spirits is slower than both decks; Merfolk has more lords, Humans has a better curve. On the other hand, Spirits sits between Humans and Merfolk in terms of quantity of disruption, with less than Humans and more than (non-atypical builds of) Merfolk. However, I argue that it plays more powerful disruption than Humans. Meddling Mage and Thalia are fairly easy to get around, and may not be relevant; Kitesail Freebooter is fragile. Mausolem Wanderer and Spell Queller are counterspells for threatening cards while Rattlechains, Selfless Spirit, and Drogskol Captain complicate interacting with the board. As a straight aggo deck, Spirits is worse than both. As an aggro-control deck, I think it has great potential. I am surprised by the volume of playable cards the new Core Set brought Modern. As Jordan noted, Wizards did give themselves the freedom to design cards with Modern in mind. Admittedly, the actually maindeckable cards are fairly few, but there are plenty of exciting sideboard candidates in M19 as well. Does your evaluation of Militia Bugler in Humans change if the probabilities of hitting in the worst and best case scenarios are 93% and 98.7%? By this math, the chances of four whiffs is roughly 1/2 x 1/2 x 1/2 x 1/2 = 1/16 (6.67%; subtracted from 100%, this gives us 92.23% for 1+ hits) in the worst case scenario you outlined and 1/3 x 1/3 x 1/3 x 1/3 = 1/81 (about 1.25%, or 98.75% for 1+ hits) for the best case scenario. In fact, even if only 1/4 of your deck gets hit by Bugler, you have a 3/4 x 3/4 x 3/4 x 3/4 = 81/256 (about 1/3) chance of whiffing. Granted, these are approximations that would need to be fine-tuned by hyper-geometric analysis, and doesn’t take into account the quality of those hits, but do show a better chance of hitting than your figures in this article. I’m not sure if these data change your evaluation too much (it’s still a somewhat clunky value three-drop that only draws one card and doesn’t hit Mantis Rider) but I hope these numbers prove useful. It does not as I knew that the real probabilities of hitting were much higher than my simplified version. My point was that Humans was the best home available for Bugler and it gets steadily worse from there. While as you illustrate, the actual probability of hitting is pretty good, the real problem is whether any deck needs Bugler. Green decks can just run Collected Company, Humans is probably better off with Bob. D&T isn’t a bad home, but not hitting Flickerwisp or Resto is a big problem because unlike Recruiter you can’t just chain activations. There’s also the issue of Bugler inhabiting a crowded mana cost. Thraben Inspector is much easier to use despite being less powerful and fits the curve better, so I’m skeptical about Bugler finding a home. I was about to make the same comment, but steric_hindrance beat me to it. I just ran the odds on an identical worst-case scenario for Bugler in Humans (for a comment in another forum), and the likelihood of a hit in the top four is indeed 92.9%. I would offer the suggestion to change the text of the piece, and add a correction footnote. 49% is a wildly incorrect number. Otherwise, the mistake will only get caught by well-informed readers, or those who choose to read the comments as well. Again, 93% is a worst case scenario. To me that makes Bugler (as a two-of) an auto-include. It’s a Silvergill Adept that filters for value, and is a far better blocker. Unlike many of your other 2/X creatures, it can swing in without risking important control aspects of your game plan–and if it does, it’s still available to block. I acknowledged that the real numbers were very different, I was simply using them to explain my thinking on Bugler’s home outside of Humans. What Bugler can actually do in Humans isn’t the issue anyway. The ultimate problem, and where Bugler disappoints for me, is in comparison to Bob. Bugler is not in the best place for Humans curvewise, though that is manageable, but more importantly Bob does more if he survives. Unless the plan is to go more toolbox, I think that the risk/reward favors Bob. How does your version of spirits beat tron? As you said, the clock is not fast (enough to outrace tron’s bombs, and ugin seems lights out for the deck), it does not run GQ or field of ruin or orher ways to break up urzatron and the interaction it runs does not seem to line up well against tron’s threats. Of course you gain some percentage points after board with stony and unified will, but game 1 looks like a nightmare. Does the chalice do more heavylifting than I can imagine or do I miss sonething? I haven’t played the matchup recently, but last year it was very good. Reason being, Tron has a lot of problems against creatures with flash and the only sweeper that can’t be answered with Selfless Spirit is Ugin. I found that actual land disruption wasn’t necessary as long as I didn’t overextend into Ugin. I just worked Tron over with spirits and then on its end step dumped my hand and won. As a long time u/w spirits player i think the new list is solid and similar to what i’ll play after m19, but may i ask why you’re playing reflector mage over nebelgast herald? Both cards fill the same role except gast has tribal synergy, has flash which plays really well in our gameplan and can be triggered multiple times, including with moorhaunt haunt tokens, where mage is a one-shot ground creature with no synergy. The gast is pretty much a consensus in the online forum i participate in, the debate being how many copies we play, not IF we play it. Did you try the card? When I was testing my initial deck I did use Nebelgast. What I found was that it was amazing when I was ahead but when I was behind it just kicked the can down the road and the clock problems I mentioned meant I still rarely won that race. I usually had enough spirits to fog an attack once, but after that I was wide open. Sometimes that was enough, but usually it wasn’t. Gast also died to anything, couldn’t block effectively when I needed to, and on a few occasions required suboptimal or weird plays to get any value. Reflector Mage is a far more powerful tempo tool and it also was great against the delve creatures that were everywhere at the time. Yeah, it didn’t synergize but made up for that with greater power. Also, it didn’t die to Pyroclasm, which was relevant. Well i don’t know the extent of your testing but me and many spirits players have had a completely different experience with nebelgast herald ever since eldritch moon was printed. Regardless of the past though, supreme phantom will make the tribal commitment even more crucial, especially since it fills the 3 toughness blocker role, and increases the density of spirits in our deck. Playing the 2x moorland haunt is even more important now, and i see no valid argument of running off tribe «similar but slightly better» cards anymore.